Posted December 19, 2018 by John Moyle & filed under Arts & Entertainment, Books & Talks. 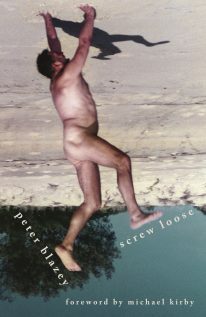 First published 20 years ago, Peter Blazey’s audacious, irresistible autobiography Screw Loose is now available in a revised edition with a foreword by Michael Kirby. Candid and at times provocative, these self styled ‘uncalled for memoirs’ encompass five decades in the life of the controversial Australian journalist, biographer and gay activist. Blazey got the scoop on the death of Harold Holt and also wrote the definitive biography of Sir Henry Bolte and The Secret Diary Of Jeffrey Kennet Aged 45 And A Quarter. During the 70s and 80s he was a journalist for The Australian, The National Times and The Bulletin. Running against Alan Jones in the 1978 NSW state election under the slogan ‘Put a Poofter in Parliament’ Blazey received 108 votes. In the early 80s Blazey inherited a small fortune and worked hard to squander it, which included buying Barbara Stanwyck’s former Hollywood mansion. Diagnosed with AIDS in 1984 he became an outspoken opponent of the anti-AIDS drug companies of the day claiming that they were ‘peddling poison’. And then there were the women in his life. To his end Peter Blazey was an unapologetic free spirit, and this account of his life remains as vivid, incisive and entertaining as when it first appeared in 1997. Tags: Alan Jones Barbara Stanwyck Harold Holt michael kirby Peter Blazey Screw Loose Sir Henry Bolte The Secret Diary Of Jeffrey Kennet Aged 45 And A Quarter.